As of today, I have finished the “birth books” of my two oldest daughters. Their prenatal ultrasound pictures are tucked inside the front covers; photographs from their early years, baptismal certificates, birthday invitations, and Christmas cards are affixed where appropriate. Most of the lines are filled with writing — not all, as I will never be able to answer the question about the fashion trends when they were born– but enough to look like I put some effort into the thing. 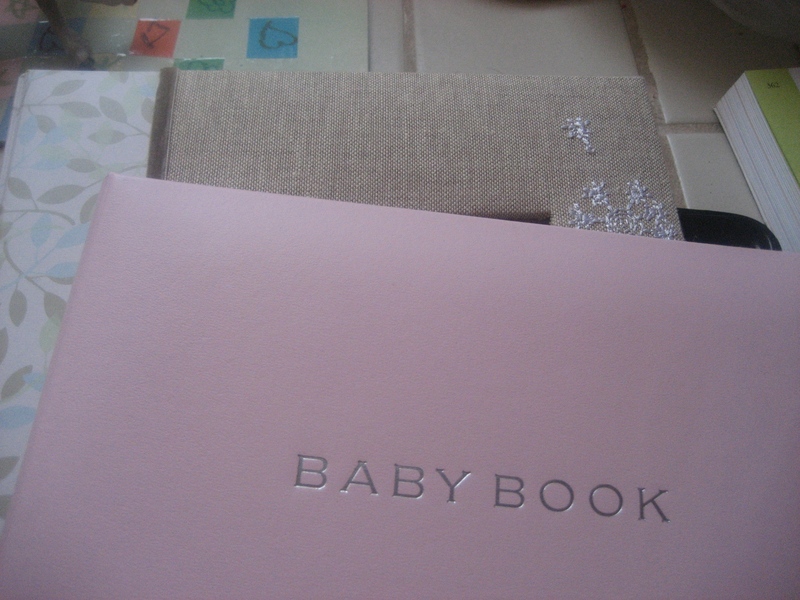 The birth book seemed like such a nice thing when I was pregnant with our first baby. It even seemed essential, in the same way it seemed essential that our nursery have a “theme,” with linens matching the lamp matching the wall art. (Ours was “Safari.”) Who wouldn’t want to record their child’s earliest moments for posterity? Hadn’t my own mother kept a detailed birth book for me? So I bought one: a thin, hard-bound book with Winnie-the-Pooh on the cover. Inside were pages dedicated to the family tree, the pregnancy and birth details, celebrations, and major developmental milestones. It was only once I began keeping a birth book for my first — and then second — child, that I realized its reassuringly thin spine and apparent simplicity were clever disguises for something more sinister. To begin with, this was not a “birth” book: each book is designed to cover the first five years of your child’s life, up through kindergarten. There were pages to accommodate multiple baby showers (I missed my first baby shower because I was giving birth, and never had a traditional shower again.) There were questions about current events during your baby’s birth year. There were lines for recording information about every single visit to the doctor or dentist. There were guilt-inducing blank boxes in which I was instructed to paste before-and-after photos of my child’s first haircut. In short, these birth books were designed for first-time parents. And now I had to do four of them. By the time I got to my third and fourth children, the format of the birth books I ordered had changed slightly: Now, the books expected you to record your baby’s height, weight, and developmental milestones during each month of their first year of life. These birth books are exercises in following through. I responded with denial. All four birth books sat on a shelf beside my computer, and I reassured myself that I’d work on them when I had “free time.” This meant that, every couple of months, I’d enter a guilty panic when I realized I’d gotten behind and couldn’t remember when my third child began walking, or how my fourth child slept at five months. The younger half of my children are going to have hard evidence that I loved them less than their older siblings. But this morning I recalled that both my first and second child have turned five, which means that I no longer had to keep up their birth books! Freedom! I spent a few minutes tying up loose ends, and then stashed the books in each daughter’s memory box in the closet. If pressed, I would say that one reason we’ve yet to wipe out poverty, war, injustice, and climate change is due to lack of follow-through. The problems are daunting, and we are all, to various degrees, lazy, selfish, exhausted, busy, and scared. I’m no different: In addition to the baby books, the list of things I’ve left hanging includes planting a raised-bed vegetable garden, baking fresh bread weekly, going through the boxes of pictures that we shoved in a closet 5 years ago, and a pile of mending. I am particularly bad at following through with people. During my sophomore year of college, I was asked to mentor a young woman about five years older than myself. She was the daughter of a family in town, and I gathered that she’d been a bit wild until she’d suffered a traumatic brain injury in a car accident. Now, her parents wanted her to have a friend who’d be a good influence. I can’t recall how I became that friend; I think it was arranged through the church I attended at the time. I knew that I was in over my head almost immediately, but I persevered through a series of awkward conversations over coffee. Looking back, it seems ludicrous to charge a 19-year-old who’s just left a sheltered home with mentoring a 24-year-old who’s lived hard. I don’t remember the last time we talked. I certainly never followed through after I graduated, and have no idea what became of her. That young woman was the first in a series of people whom I’ve failed similarly. I’ve neglected to follow through on relationships from Africa to California and in between. But every Sunday some of those struggling people are missing. Sometimes they’re gone for weeks or months; sometimes they disappear completely. I know this is common, but I always feel badly, like maybe if I’d been more friendly, or done something to help, they’d still be there. I’m not proud of my lack of follow-through, and I’m trying to do better. I’m trying to reach out to people when I think of them and to do kind things when they occur to me, instead of hiding behind the “I have four young children” excuse. Because the truth is that something is always better than nothing. And finished is always better than left hanging. Like with those baby books: Sometimes you just have to fill in what you can and call it done, even if you leave a few blank lines. There will always be blank lines. Maybe they weren’t yours to fill in, anyway.